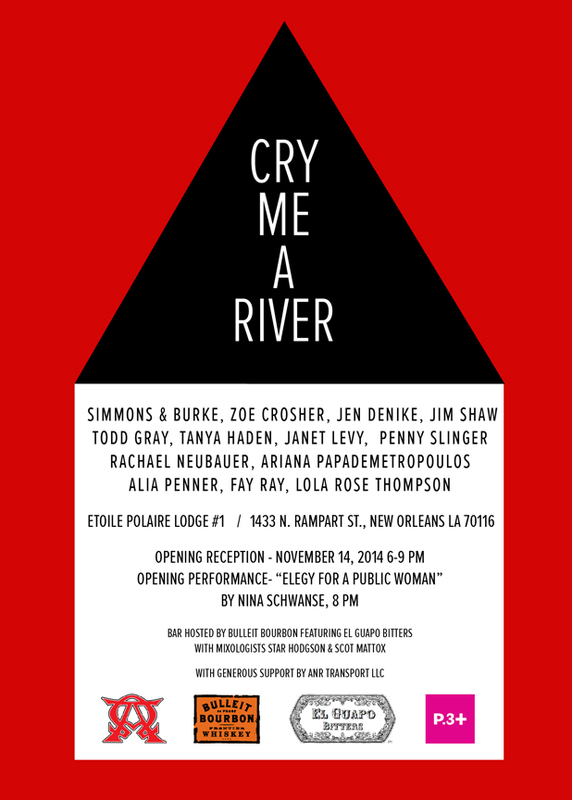 “Cry Me a River” is a group exhibition of art and perfomances curated by Janet Levy. The exhibition is included in P.3+, a satellite program of Prospect.3 New Orleans. Prospect.3 is the third edition of New Orleans International Contemporary Art Biennial. “Cry Me a River” will immerse the viewer in a spirited flow between symbol and performance. Set at a historic masonic lodge in New Orleans, the site itself is the perfect conduit for arcane meanings, rituals and dualities. Artists objects, sculpture, photography, collage, drawings, installation and performances will occur throughout the space in response to its contours and mysteries. The show includes works from an exceptional group of established and emerging artists – Simmons & Burke, Jen DeNike, Todd Gray, Zoe Crosher, Tanya Haden, Rachael Neubauer, Ariana Papademetropoulos, Alia Penner, Fay Ray, Lola Rose Thompson, Janet Levy, Jim Shaw and Penny Slinger.